Sevenson has completed 30,000 cubic yards of contaminated sediment removed from Pompton Lake, with 100,000 more to go. The Sevenson workers have dredged and hauled away about 2,000 truckloads of contaminated sediment in the first phase of a long-awaited $50 million cleanup of a portion of Pompton Lake. Equipment at the site is now being removed for the winter, and activity won’t resume until March or April, when the far larger second phase of the cleanup begins to remove sediment laced with mercury, lead and other contaminants from about 36 acres of the 200-acre lake on the border of Pompton Lakes, Wayne and Oakland. Before the project began, residents raised concerns about the potential for dust, noise and truck traffic that might be generated. 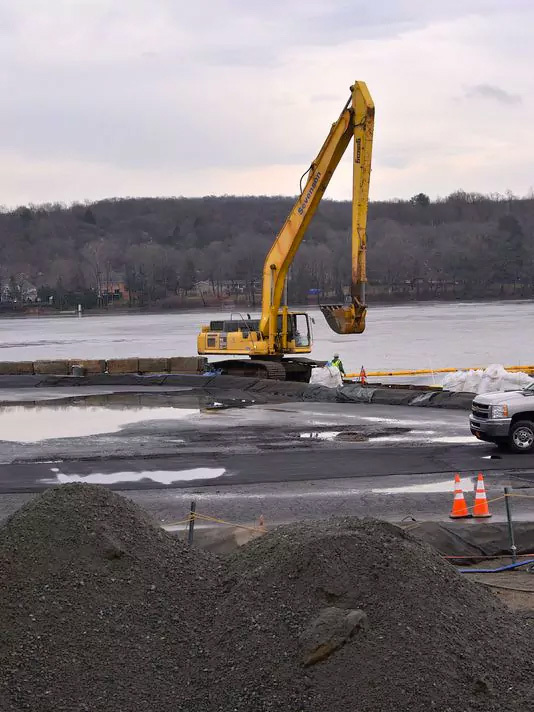 But Pompton Lakes officials and some residents said the work has proceeded without disrupting neighbors or Lakeside Middle School, which is next to the staging area for the equipment. “This part of the cleanup went very smoothly for us,” said Michael Serra, the Pompton Lakes mayor. “The school seemed to be able to work around the issues. There were a lot of concerns by parents about truck traffic, but we were able to move some crossing guards into new locations. “It’s good to see the project move ahead,” Serra said. He said he received no complaints about truck traffic or noise.